Sporting a red bow and jingle bells, this cute little Cushy Kids stuffed reindeer has soft brown fur, stuffed felt horns and a bright red nose. The elastic loop makes Cushy Kids plush reindeer Baby Jingle a great take-along friend. 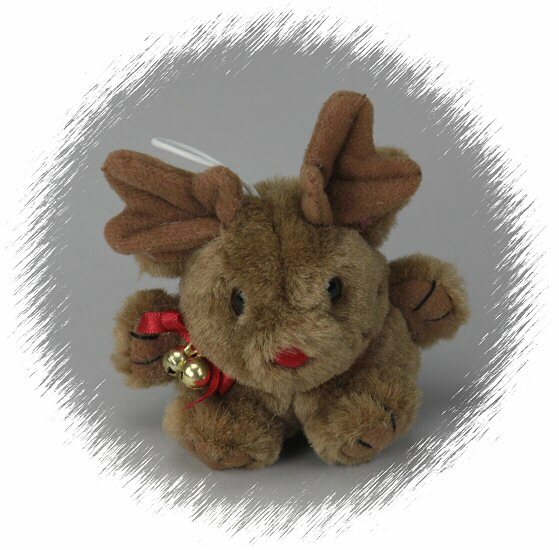 Baby Jingle plush reindeer not only make wonderful gifts, but they are also perfect as ornaments, package tie-ons, and birthday bag favors. This cuddly reindeer has soft and shiny brown fur, fun tan antlers, and a code to the virtual Webkinz world. This sweet Mini Cuddlekins stuffed fawn deer is oh-so-cute with its soft spotted fur and white accents. This adorable Wild Watchers stuffed fawn has soft light brown fur, white accents and spots, and loving eyes in a sweet face. This adorable Baby Reindeer charm is sure to put you in the holiday mood with its 3-dimensional body and shiny red nose. This Reindeer Countdown to Christmas stocking has an adorable 3-dimensional plush reindeer and beautifully embroidered numbers.